All Dura-Bond shims meet or exceed OEM specifications. Only prime quality cold rolled steel is used. Avoid loss of power due to weak spring tension. Refacing valves and the grinding of valve seats causes loss of metal. This loss of metal results in the loss of proper spring pressure. To restore the proper spring tension, one must replace the lost material by installing a Valve Spring Booster Shim under the spring. 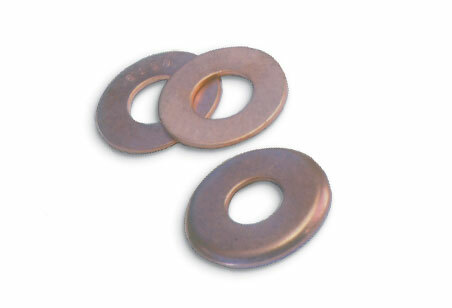 Dura-Bond Spring Booster Shims are available in both case hardened High Performance and regular series. All shims are made from prime quality cold rolled steel, and all shims meet or exceed OEM specifications. 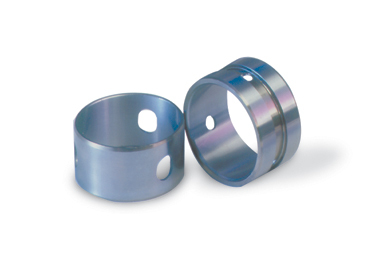 The shims are manufactured in sizes up to 3.00″ diameter and up to .060″ thick. Standard production yields three common thicknesses: The 1000 Series at .015″ thick, the 3000 Series at .030″ thick, and the 6000 Series at .060″ thick. 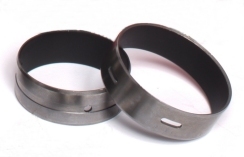 A cupped shim is available for applications where the spring base pad area is too shallow to hold the regular shim and spring in the proper position. Both sides are flat and without serrations or marks of any kind. Non-serrated shims do not damage the spring pad area on today’s aluminum cylinder heads. Non-serrated shims lay flat so as not to set up and harmonics in the spring. Non-serrated shims lay flat so as not to introduce any lateral loads on the spring, valve, or guide.